All transactions are safe and secure with a reliable history in online purchasing behind each of our associates. 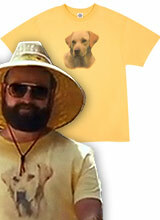 Buy the Yellow Labrador t-shirt from The Hangover 2 Movie to own Hangover 2 clothing and merchandise. We've all seen people who wear dog shirts. You know the type. Alan Garner doesn't quite fit that mold. Instead, he makes this Yellow Labrador shirt from the movie Hangover 2 cool. After the film's trailer was released, Alan's dog tee quickly became the most popular clothing item from the movie. It features the same dog that we see him making out with in the driveway at the beginning of the first film. There's nothing wrong with showing your appreciation for man's best friend, or Alan's. In addition to the Yellow Labrador tee from The Hangover 2 Movie above, browse the Hangover 2 Clothing Gallery for more apparel like men's and women's clothes, kids shirts or hoodies.